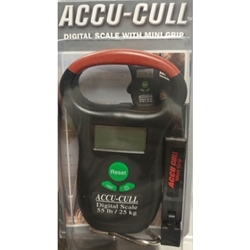 The Accu Cull Digital Scale weighs up to 55 pounds and will measure in kg/lb/oz. This Digital Scale weighs in 100ths of pound with hold function on a big LCD Screen with Blue Backlight. Requires 2 AAA Batteries but has and Auto Shutoff after 50 seconds to save battery life.